Club Molisani is a premier bocce club established in 2005 in the Midwest/Northeast/Great Lakes hotbed of bocce, Wickliffe, Ohio (Cleveland). Each year the club runs popular bocce tournaments. 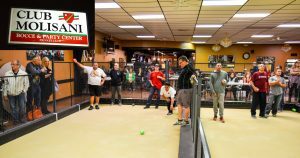 The club boast 3 indoor synthetic bocce courts that are 12′ x 68′. Be sure to check out the schedule.